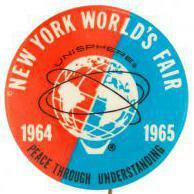 Discuss the many exhibits and attractions that made this Fair unforgettable. Anyone up for a visit to the Great White Way? Don't forget where we parked! OK, art detectives, give this one a try! Can anyone identify this car being driven at the Fair? Got room on your bookshelf? Can anyone pinpoint exactly where this mural was located? The book is nearing the finish line!